Did PIOMAS also say volume was record low this spring? No and certainly not significantly (more than the uncertainty). I believe SMOS had volume 8% lower than 2012 at the end of the freezing season. Interesting…PIOMAS in its graph has it on 21600 km3 mid April at maximum. Werther, the CryoSat domain is not the same as that of PIOMAS. Discussed in the beginning of this very thread. See for instance this post, with the normal PIOMAS volume and the PIOMAS-volume-on-Cryosat-domain. I thought it would be something like that, Like Bering Sea, SoOchotsk cut out. Haven't read this thread much or forgotten about the content. Looking back, I saw your Feb map on the Cryosat domain. It cuts out a lot of other peripheral seas: the CAA, Hudson, EGS, Barentsz and Kara! Leaving only 7.289 Mkm2. according to my CAD 'Total Arctic Ocean' map. Not hard to guess how it arrives on 15000km3. 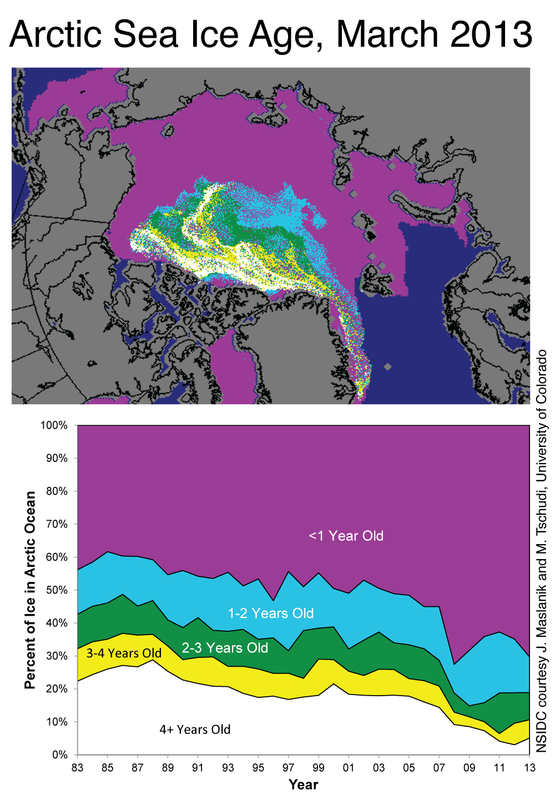 And I remember, a lot of the PIOMAS volume at maximum came from extent growth in the Baffin/Barentsz/Kara seas. Ok, thanks, and what are the comparable PIOMAS-numbers, if they're available for 2013 in particular? I would have to compute them from the PIOMAS gridded data like I did here. Here you are. My estimate of IceSat domain is earlier this thread. Ok, thanks, so CryoSat and PIOMAS are getting closer in their results over these years/so far, and give almost the same number for this year's maximum. Only a little over 1% difference is way within both error/confidence ranges, as far as those have been estabilished for CryoSat (about 9% uncertainty range for PIOMAS and about 5-7% for CryoSat?). Indeed, the interesting thing is you only get from SMOS' brightness temperature to sea ice thickness by knowing the atmosphere record (like PIOMAS), notably ice temperature. However, SMOS only works up to ~0.5m thickness. I remember the 8% figure too, but couldn't find the source, was CS2 data already used? Nevertheless, PIOMAS having 11-13 April volume in the same ballpark makes me wonder. I think the -8% thickness number(Cryosat April) was reported in the "Sea Ice Outlook", unfortunately NSIDC is down till Monday. I hope everyone and the servers are all right. Is there a bias in this Cryosat map? Or is it real? Quick recovery of the sea ice extent and thickness after the record minimum of september 2012? In PIOMAS data, the volume doesn´t rebound above 2011 until spring 2013... Who is right? It's all just variation within the error bounds for PIOMAS, not sure what Cryosat error bounds are but I'd assume the same there. I don't know what to make of it. But last year catching up with 2011/10 winter maxima isn't a surprise, although I think it's informative. This year and last show what impacts weather can have either way on the melt. There's something going on here but I'm not sure what. That comparison shows volume increase between the end of ICESat and start of Cryosat 2. Yet PIOMAS shows a drop in volume between those dates, and PIOMAS compares well with Cryosat 2 (the Laxon paper), and with ICESat Schweiger 2011 "Uncertainty in Modeled Arctic Sea Ice Volume"). It is never wise (scientifically speaking) to compare numbers without considering their uncertainty. Kwok et al specify a RMS (one sigma) error in volume of 2.28 [1000 km3] for fall, and 1.562 [1000 km3] in winter. When I was younger, I was never allowed to specify uncertainty in 4 decimals. They also specify trends, but strangely enough without uncertainty. Perhaps it is the text somewhere that the derived trends numbers are meaningless. Anyway, the difference between ice volume in fall is less than one sigma, and in winter well below two sigma. It cannot be said (meaningfully) that something is going on. I did do a rough calculation using the uncertainties, and by my calculations only by selecting the highest for Kwok and lowest for Laxon did I get a reasonable drop between the two series. Which lead me to suspect something else was going on. But I didn't go as far as reading off values and spreadsheeting so perhaps you are correct and there is no issue. Which lead me to suspect something else was going on. But I didn't go as far as reading off values and spreadsheeting so perhaps you are correct and there is no issue. There is nothing personal here Chris, but the when I saw Diablobanquisa's graph for the first time, I wondered about the error bars. They make the visible discrepancies meaningful or not. When I figured out what the error bar size was, I concluded probably not. Even without considering uncertainties in CryoSat and PIOMAS nrs. My idea is that Laxon deliberately used averaged IceSat numbers because the trend in them is questionable. And with just the average + the Cryosat2 + PIOMAS there is little remarkable going on. Or do you still see some discrepancy? Regarding IceSat vs Cryosat, IIRC due to different orbits Icesat captured a full image within 3 month where CS2 only needs one month. Thank you! They have the downloadable data as NetCDF files as well. I do see what you say, and my conclusion was using a calculator at 06:00 - so was far from sound. I was just treating it as an early morning 'can I solve it issue'. I think your idea regards average numbers is probably correct and you were correct to point out error bounds. Nothing personal taken. But as for spreadcheating... Hey! That's what I do! Thanks for that, it goes to show how blunt a tool PIOMAS is, there's much more small scale variation in the Cryosat image. But it does support the predominant FYI state of last winter. Unfortunate that that didn't lead to a massive melt this year. 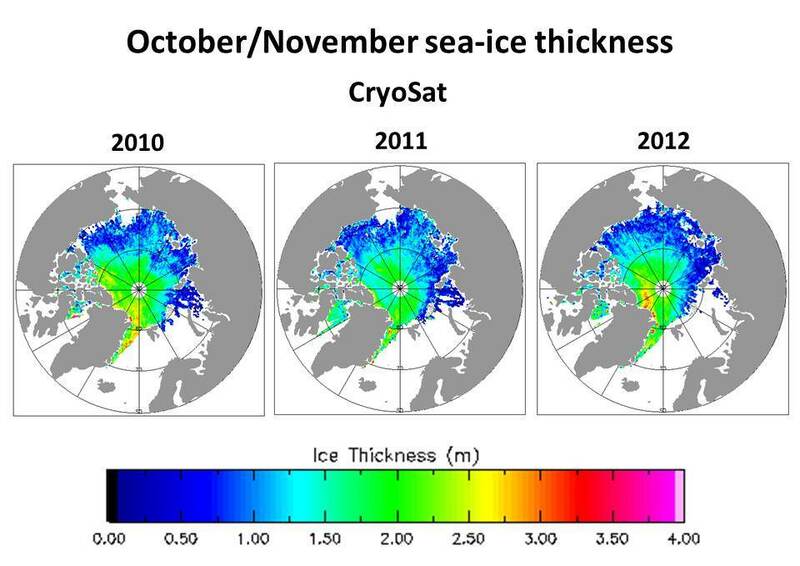 But the feed through of thicker ice into next March will be a good further test of Cryosat. For that 'feed through', a good refreeze will be necessary, Chris. It remains to be seen whether '13-'14 is going to provide that. Now lets start. EASE is equal area, so not the hassle with grid cell area calculation, hmm sounds too easy. The spelling checker did not like spreadsheeting either and suggested "spearheading"
I know that you use spreadsheets and I also know that you are happy with it. Can you handle NetCDF and HDF files? ... there's much more small scale variation in the Cryosat image. I've got an app that copies netcdf into Excel files, but haven't spent the time writing a macro to get the data into arrays because Excel 2007 can't handle massive files, and some of the data I've been looking at for NCEP/NCAR is in >100Mb files. Arcticio is right that I should move to a better platform, but I balk at the time involved in learning a new language to the degree that I can use Excel and VBA. On the subject of spellchecks, my blog's spell check doesn't like spreadsheet either, more weird is that it doesn't like the word blog. Looking at the meereiportal image above shows more of the sort of variation I'd expect. When I first saw the PIOMAS thickness data my initial response was surprise at it being so smoothed. I'm looking at trying to make a prediction for this winter's maximum volume. There's a relationship between autumn/winter volume growth and area/extent/volume at the minimum such that in recent years lower minimum leads to greater autumn/winter volume growth. I've done quite a few blog posts recently and want some time off, but my preliminary playing around with the data produces the following tentative figures- based on the three stated indexes at minimum, with a rough guess of 4.9k km^3 for the volume minimum. The latter PIOMAS volume is the one I'm least happy with as the increased ice growth in autumn/winter isn't really related to volume but to the increasing amount of open water in the last few years. I've not worked out proper error bounds for those yet, the RMS error for the ten years used in each case is in brackets. However I'm not sure I'm happy with the other calculations though - if CT Area and NSIDC Extent based calculations are correct then that suggests a lower maximum volume due to the growth/thickness response than over the last three years! Adding on the RMS error brings about 22.2k km^3, between 2011 and 2010, but closer to 2011 than 2010 - which fits my gut instinct better. I have no problem (in R using ncdf4 lib). There are a *lot* of invalid grid cells, especially the ones that fall off the globe due to the projection: the earth's surface is a circle within the square grid. Re. smoothness, an eye opener to me was the ice bridge data. Everything else looks heavily smoothed since then. The thing with CS2 is pixels side by side might have a time diff of 30 days, look the ray pattern following the latitudes. 196.27345,0.0,1.4E-44,2.8E-45,2.8E-45,1.8416428E34,1.009E-42,2.8E-45,7.366571E34 ... with NaNs spreaded without any system. Makes no sense at all. That is not good. Here the numbers that are not NaN, are between 0.19583 and 7.548747. Equal area is nice to do the math, but plotting involves regridding, which consumes a lot of machine cycles and let the virtual machines I use in the cloud die. Don't tell me R does this out of the box. How far are you already? Does AWI meets the CPOM results? I don't see why you need regridding. Just plot pixel by pixel as x,y and there is a recognizable image. In fact I think the images on http://www.meereisportal.de/ are in this projection. The result with NaN's coded as white is attached. I also need a landmask in this projection for nice images, it does not seem to be in the nc files. So these data need to be restricted to the IceSat domain as well. The March 2013 value looks not good. Suggestions welcome. Chris, was just kidding. I have the same problem when I look what people do with R. But wasn't a butterfly in the Amazonas causing the weather patterns? Are you diving chaos theory? Wipneus, yes, the landmask is it what forces me to regrid. I want SMOS, PIOMAS and CS2 all on same map (style). Plotting an aray works similar with Python. I see. I am actually considering moving my calculations to Python this winter. R is using too much resources to put on small server as is my intention. Laxon did not use the same data source, so in principle it is possible that "thickness" in the nc files means thickness averaged over the full cell surface. There is no indication in the NetCDF meta data that this is so though. The meta data is very meager anyway. Wipneus, you're right, area * concentration * thickness = volume. Got it confirmed. Thanks for that. It's lucky I popped in to see what's going on. I missed the post you quote. I've found a recent presentation about the German CryoSat data. It gives some interesting insights into error handling, but most importantly it details a bit on the 11-13 winter thickness trend, which is flat in PIOMAS and downwards with CryoSat. I've found a recent presentation about the German CryoSat data. The presentation suggests that snow cover on top of the sea ice is still a source of uncertainty for the CryoSat-2 thickness calculations. They use climatological data for the snow depth (with a few modifications). So if the actual snow depth in the winter of 2012/2013 was reduced compared to the two preceding winters (as suggested by the patterns for sea level pressure), perhaps that explains part of the decline in the CryoSat-2 thickness over the last 3 winters. It's hard to say since the recent results are not published yet. Thanks Steven, that should have occurred to me before. CryoSat SIRAL acquisitions stopped yesterday (2nd October) at 16:23:01 UTC due to an onboard issue which is under investigation. Science measurements will resume as soon as possible but not earlier than the beginning of next week. Activities to recover from the platform problem experienced on Wednesday 02 October at 16:23:01 are ongoing according to plan. The SIRAL instrument still remains switched off. CryoSat teams are working around the clock to resolve the anomaly and resume science measurements as soon as possible. SIRAL (Synthetic Aperture Interferometric Radar Altimeter) is the main instrument on board CryoSat-2.